Survey spectrum from barium oxide showing various barium and oxygen peaks and a carbon peak. 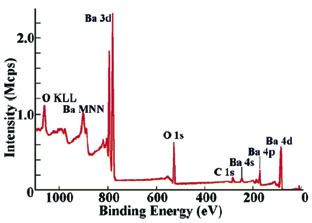 To demonstrate an XPS spectrum, a survey spectrum of barium oxide was produced using a wide energy range. The spectrum shows various barium and oxygen peaks as well as a carbon peak, which is a surface impurity. The barium oxide spectrum can be collected in approximately 10 seconds with a modern XPS spectrometer. Because barium oxide is an insulator, a low energy electron beam was directed onto the specimen during analysis to control specimen charging. There is a significant background beneath the peaks in the spectrum, which is caused by electrons that are inelastically scattered before leaving the sample surface. Such scattering reduces the kinetic energy of the electrons and reduces intensity from the peaks. The background must be removed from the spectrum before quantifying the spectrum. It is also possible to determine chemical states from an XPS spectrum. The C 1s region of the XPS spectrum from two preparations of polyethylene terephthalate (PET) is shown below. 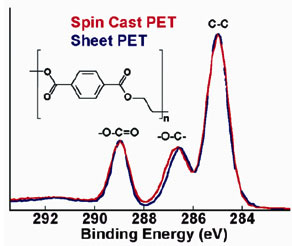 The two specimens differ in the method of preparation, one is spin cast while the other is sheet PET. The carbon atoms in PET are present in three chemical states, which are reflected in the three peaks of the XPS spectrum. The two methods of preparation result in different conformations of the polymer, which also affects the spectrum by shifting the (-O-C-) peak slightly.